In many of her writings, Mariane Hedegaard insists on the centrality of motives in understanding development. Taking the concept of motives to heart, this chapter explores the development of independence in young people with severe disabilities. Vygotsky understood disability as an incongruence between the individual’s psychological structure and the structure of cultural forms. The incongruence describes a dialectical relation between the person with a disability and the surrounding society. Thus, a disability is never stable, but changes over time as a function of both individual development and the shape of the supportive activities and assistive technologies in the person’s activity settings. A study of eight young people with congenital motor impairment and severe difficulties in developing verbal speech is presented. The young people and their parents were interviewed about the life history of the child and the family and the young person’s current situation. 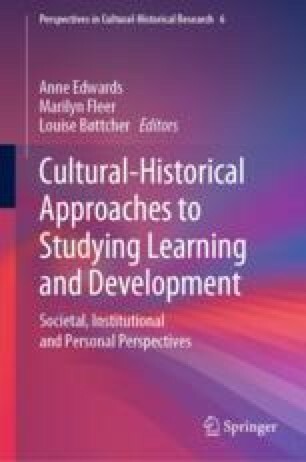 The analysis unravels how cultural-historically grounded practices for support impacts on the child’s social situation of development, including development of independence. The point of the chapter will be to discuss the benefit of understanding independence as a developmental and relational phenomenon. Focusing on motives and developmental crises in the social situation of development highlights the development of independence as related to societal opportunities and institutional motives. Tamaru, A., McColl, M. & Yamasaki, S. (2007). Understanding independence: Perspective of ocupational therapists. Disability and Rehabilitation, 29(13), 1021–1033. https://doi.org/10.1080/09638280600929110.